Royster eighth graders put their quadriceps to work in science class as they tried to generate enough electricity to light three different kinds of light bulbs. 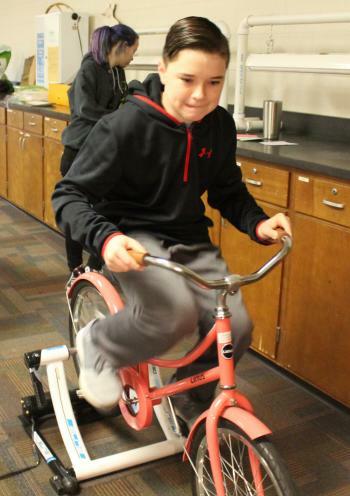 The students took turns riding a pair of stationary bicycle generators loaned to the middle school by the K-State Engineering Extension and the Kansas Energy Program, funded in part by grants from the Kansas Corporation Commission. Science teacher Michelle Johnson discovered the loan program online and thought it would complement the eighth graders unit on Interactions and Forces that focuses on electricity and magnetism. “I thought it would be a great hands-on activity for the students to help them see how important efficient technology is,” Johnson said. “We also were able to talk about electromagnets because the bikes are set up on kinetic motors that generate the electricity to light the bulbs. Attached to a board were three types of bulb, LED (light emitting diodes), CFLs (Compact Fluorescent Lights) and Incandescent Light Bulbs. There was also a switch for one bulb or four bulbs. 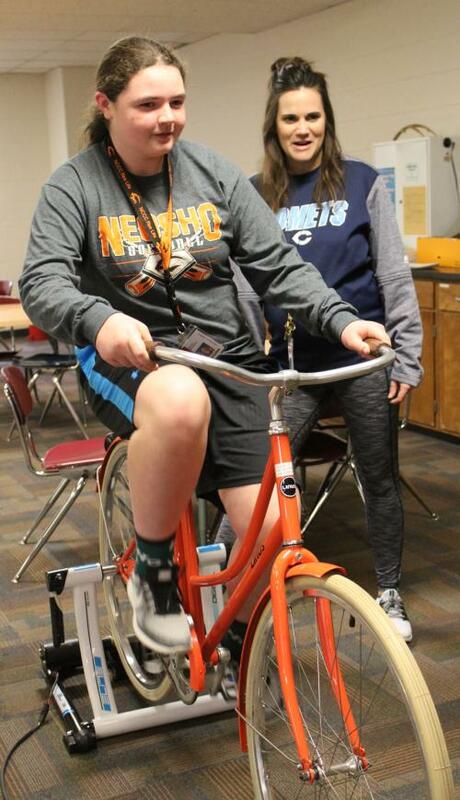 The first time, each student pedaled hard enough to light up one LED, CFL or Incandescent bulb. Then science teacher Jory Murry turned the switch to four, and they pedaled to see if they could light up more than one bulb of each kind. Murry asked a group of three students to predict what would happen. “Which bulbs do you think will be the easiest to light up?” she asked. Eighth graders Brandon Sipes, Gage Hanna and Alaina Henderson said it would be the LED because it uses less energy. “And it lasts longer,” Sipes added. Students saw and felt the difference in effort levels it took to light the LED, CFL and Incandescent lights. It’s easier to light up the LED,” Olivia Taylor said. “What does that mean?” her teacher asked. “It takes less energy and that is saving energy for something else,” she said. Johnson tied the comparisons of the bulbs to the lights in the Royster hallway that were recently switched to LED lights. LEDs last up to 10 years, while Incandescent ones work for one to two years. Even though the bulb may be more expensive to purchase, the overall cost savings can be significant based on factors such as how long it lasts, she pointed out.